A 40-kilowatt solar array was recently installed on the top level of the parking ramp at the Maplewood Mall Transit Center, near the Maplewood Mall. The panels will help offset a portion of the energy used at the transit center, saving approximately $6,000 in utility costs annually. In addition to lowering energy costs, the system will help Metro Transit better understand how to use solar arrays at other existing and future facilities. Proposals to install arrays atop six Metro Transit support buildings, including several bus garages, are now under review. Solar panels are also in use at Metro Transit's 610 & Noble Parkway Park & Ride, Rail Support Facility and at several bus stops throughout the region. 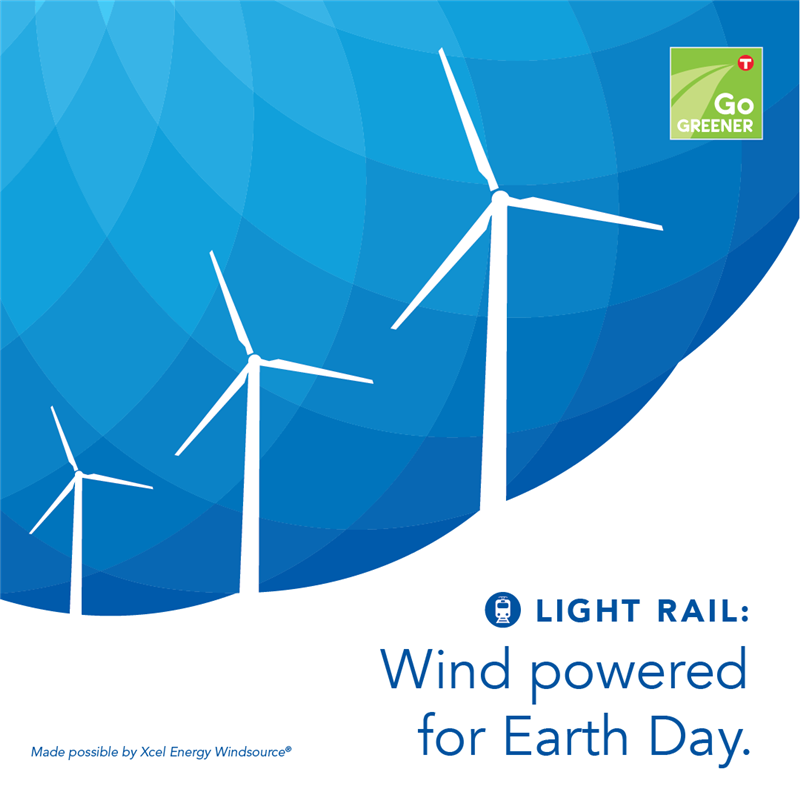 Metro Transit is also supporting solar energy by purchasing power produced from installations at two Council wastewater treatment plants. Metro Transit is one of a handful of agencies to obtain Gold Level certification through the American Public Transportation Association's Sustainability Commitment Program. Most days, Matt Privratsky gets to work by taking an hour-long walk from his Midway area home to downtown St. Paul. The 3.5-mile trek might also involve boarding a bus, catching the METRO Green Line or using a Nice Ride bike – or some combination of all of the above. The multi-modal approach reflects the habits of many of his co-workers at Fresh Energy, a St. Paul-based independent non-profit that works to make Minnesota’s energy system cleaner and more efficient. Ninety percent of Fresh Energy’s staff walk, bike or take transit to work. While sustainable transportation naturally aligns with Fresh Energy’s mission, it also reflects a robust transportation benefits program. Employees can earn $2 per day by walking or biking to work. Fresh Energy also matches employee spending on transit. To help car-free employees like Privratsky get to appointments and meetings during the day, Fresh Energy subsidizes annual Nice Ride memberships and has accounts with car-sharing services car2go and HOURCAR. Fresh Energy’s efforts were recognized this week at the Commuter Choice Awards, where employers, organizations and individuals who share a commitment to sustainable transportation were celebrated. 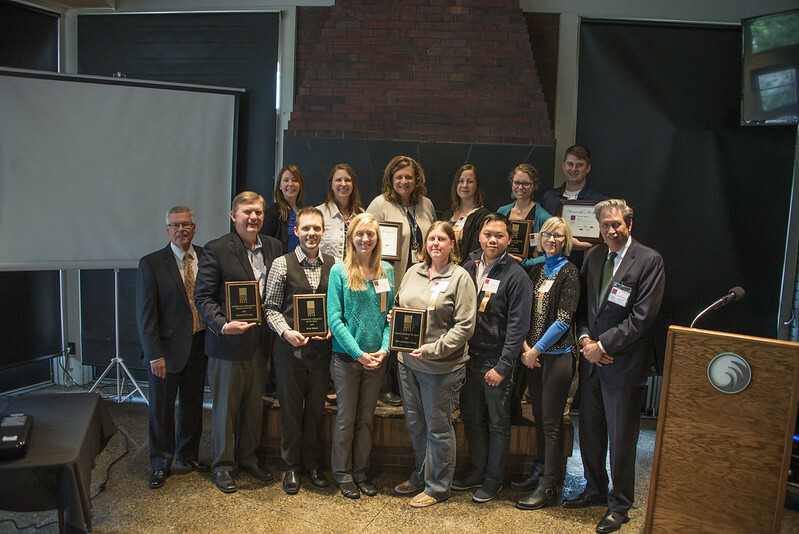 The annual awards were presented by Metro Transit in partnership with the region’s Transportation Management Organizations (TMOs) – Commuter Services, Anoka County Commute Solutions, Move Minneapolis and St. Paul Smart Trips. A panel of Twin Cities transportation experts evaluated nominations in selecting the winners. A list of awards presented at the 2016 Commuter Choice Awards is below. Learn how Metro Transit and the region's TMOs can help your organization here. Directly adjacent to the Nicollet Mall Station, CenterPoint Energy’s new corporate headquarters provides employees convenient transit access. The move also presented an opportunity to create a new shared space for Meet Minneapolis and Move Minneapolis, which promotes transit, carpooling, biking and walking among downtown Minneapolis commuters, residents and visitors. The street-level retail space opened in 2015. Fresh Energy’s commitment to clean energy and sustainable transportation is reflected in the non-profit’s transportation benefits program. Employees can earn $2 per day by walking or biking to Fresh Energy’s St. Paul offices. Fresh Energy also matches employee spending on transit. To help employees travel to appointments and meetings during the day, Fresh Energy subsidizes annual Nice Ride memberships, has a business account with car2go and has a corporate account with HOURCAR. As a result of their comprehensive transportation benefits program, 90 percent of Fresh Energy staff walk, bike, or take transit to work. The St. Paul Public Housing Agency has gone above and beyond to encourage active transportation among residents in its housing communities. Partnering with Cycles for Change, nearly 900 free bikes, helmets and locks have distributed to youth since 2012. Residents also have access to free Nice Ride memberships, bike repair stations and workshops on bicycle maintenance. Resident-led walking groups have also encouraged residents to move more and explore their neighborhoods. Since taking over Best Buy’s commuter benefits program in 2015, Brian Nelson has worked to enhance and expand benefits for employees at the company’s Richfield headquarters and at locations across the country. Nelson advocated for and then helped to implement a pre-tax commuter benefit program that allows employees to pay for their transit costs with pre-tax dollars. The number of employees who use transit, carpool and vanpool have risen as a result of his efforts. Minnesota Life College offers a three-year program for individuals with Autism Spectrum Disorder and other learning disorders. As part of their life skills training, instructors teach these individuals how to travel independently on transit. By building their skills and confidence, graduates have the freedom to get themselves to work and appointments, run errands and pursue their dreams. Solar panels have been installed at 17 new boarding locations, supplying energy to keep waiting shelters lit at night. The solar-powered shelters are located at sites along Xerxes Avenue in Brooklyn Center, on Fremont, Lyndale, Plymouth and West Broadway avenues in North Minneapolis and at several locations in Brooklyn Park. With the latest wave of installations, there are now more than 30 Metro Transit shelters supplied by solar power. In 2010 and 2012, solar panels were installed along Franklin Avenue and at sites in Brooklyn Center, Brooklyn Park and North Minneapolis. The pole-mounted solar panels feed a rechargeable battery pack that can provide up to 30 hours of energy for motion-sensored lights. Metro Transit is currently exploring options for mounting solar panels directly on shelter rooftops. Solar panels are used at sites where the cost of powering the site through a utility connection is cost-prohibitive. Where possible, lighting will be included at all shelters installed through the Better Bus Stop Program. By the end of 2015, shelters will have been installed at 51 locations where none had previously existed. Many of these sites will include light. The solar-powered shelters are a small part of a broader effort to cut the amount of purchased energy used at Metro Transit facilities in half by 2020. Large solar arrays are in place at the 610 & Noble Parkway Park & Ride in Brooklyn Park and at the Rail Support Facility in Minneapolis. In 2016, rooftop solar arrays will be installed at bus garages in Minneapolis, Bloomington and St. Paul, as well as a light-rail maintenance facility on the METRO Blue Line and a bus maintenance building in St. Paul.